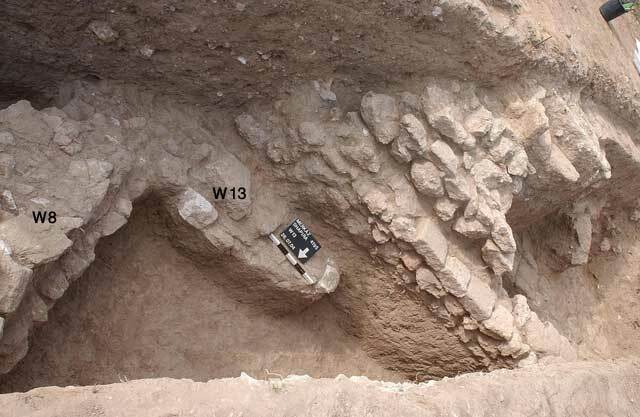 During June–July 2004, a salvage excavation was conducted at Es-Sawafir esh-Sharqiya in Merkaz Shapira, c. 20 m from the Qastina-Ashkelon road (Permit No. A-4195; map ref. NIG 17230/62309; OIG 12230/12309), following the discovery of antiquities during infrastructure work. The excavation, undertaken on behalf of the Israel Antiquities Authority and underwritten by the Meqorot Water Company, was directed by D. Varga, with the assistance of H. Lavi and Y. Haimi (administration), A. Hajian (surveying), T. Sagiv (field photography) and C. Hersch (pottery drawing). The village of Es-Sawafir esh-Sharqiya had been located in the past on the southeastern bank of Nahal Lakhish. 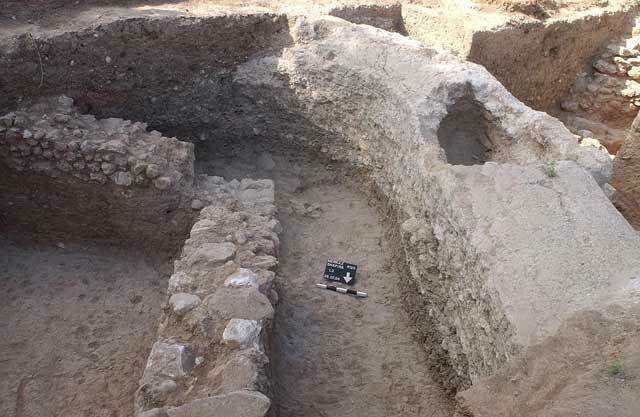 Remains from the Byzantine period had been exposed in previous excavations at the village of Es-Sawafir el-Gharbiya (HA-ESI 113:106*–107*; HA-ESI 117). The excavation area (140 sq m) revealed buildings remains that dated to the Late Roman (third–fourth centuries CE) and Byzantine (fifth–beginning of seventh centuries CE) periods. Pottery vessels from the Abbasid period (eighth–tenth centuries CE) were discovered on surface. The limited size of the excavation, which consisted of a strip of half squares and one square that was excavated in its entirety, hampered the understanding of the site, yet it was possible to evaluate several of its characteristics. 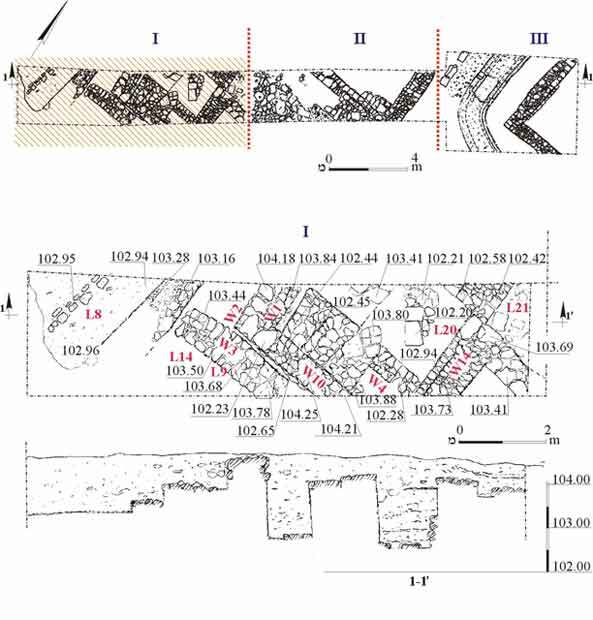 Throughout all the habitation periods at the site, it seems that the settlement’s buildings were oriented north–south and constructed according to a proper plan (Figs. 1, 2). The walls of the structures were mostly built of dressed kurkar stones (0.15 × 0.30 × 0.20 m; Fig. 3), with a few mud bricks. No mud-brick walls survived; however fragments of collapsed mud bricks were found mostly in the eastern squares. The buildings had stone, plaster or tamped earth floors. On one of the floors in a building from the end of the Byzantine period were remains of a delicate white mosaic (L8; c. 0.2 m below surface) that was hardly preserved, except for several tesserae that survived in situ. An aqueduct (L2; width 1.2 m, height 1.35 m; inner dimensions 0.80 × 0.95 m) was exposed below an alley that passed between the houses of the settlement in the Byzantine period; only its covering protruded above the pavement of the alley. 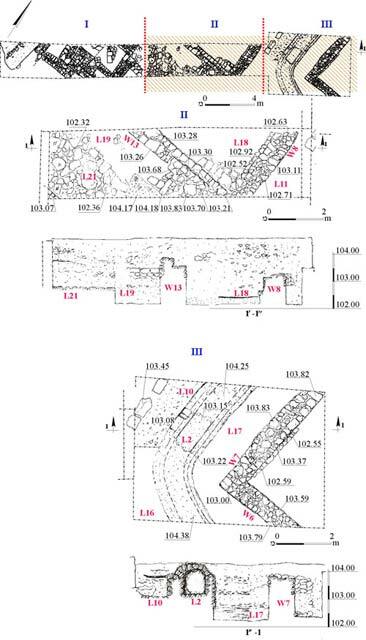 The walls of the aqueduct and its floor were built of kurkar stones and coated with hydraulic plaster (Fig. 4), whereas its covering consisted of a kurkar and mortar casting mixture. Potsherds, wadi pebbles and fragments of coins were discerned in the components of the covering that had partly collapsed. Control openings that were intended to provide access for cleaning the aqueduct were discovered in the covering. The aqueduct’s foundation trench was dug at the level of a floor (L17), which abutted the wall of the building to its west. The course of the aqueduct was parallel to the walls of the structures on either side of the alley (W7 to the east and W8 to the west) and it therefore seems to have been founded together with the building complex and the alley. Based on the northerly direction of the water flow, the aqueduct’s source was located south of the exposed section. The poorly preserved remains of an industrial installation (winepress?) and a tabun (diam. 0.7 m) were discovered at the western end of the area. The installation had a plastered floor that sloped slightly to the west. After the installation was no longer in use, it was converted into a refuse pit and fragments of pottery vessels from the Byzantine period, mostly cooking pots and Gaza jars, as well as animal bones were found in it. Several fragments of cooking pots, ash and organic material were found in the tabun. Most of the recovered pottery was characteristic of the sixth–seventh centuries CE and included bowls (Fig. 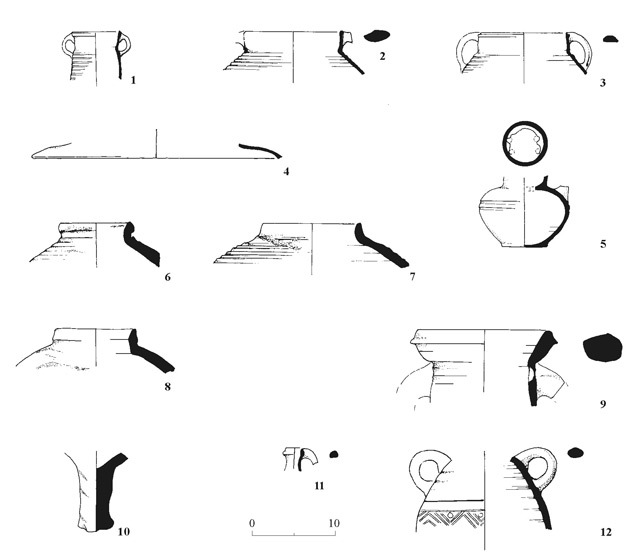 5:1, 3, 4, 6, 7), kraters with a horizontal and wavy combed design (Fig. 5:8–10), a juglet (Fig. 6:11), cooking pots (Fig. 6:1, 2, 5) and jars, mostly baggy shaped (Fig. 6:6). 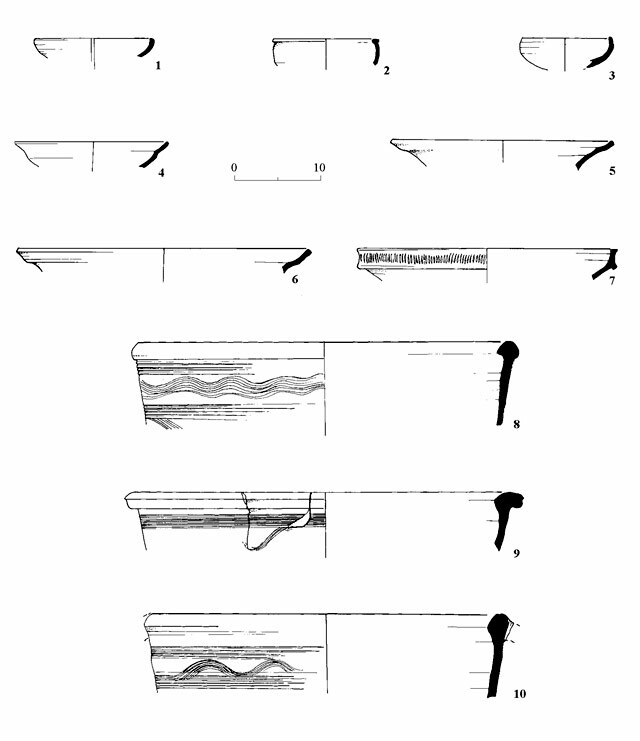 A few of the vessels dated to the fourth century CE, namely bowls (Fig. 5:2, 5), cooking pots and a lid (Fig. 6:3, 4), a jar (Fig. 6:7) and amphorae (Fig. 6:9, 10). Pottery vessels, mostly jars that dated to the Abbasid period (Fig. 6:12), were found on the surface at the eastern end of the excavation, as well as a few glass fragments and animal bones. It seems that the settlement, of which only a small part was excavated, existed from the fourth to the beginning of the seventh centuries CE. It was well-planned and built on top of properly organized infrastructures. Only a few potsherds that dated to the Abbasid period were found. 3. Wall 8 and Wall 13, looking south. 4. The water conduit (L2), looking south.